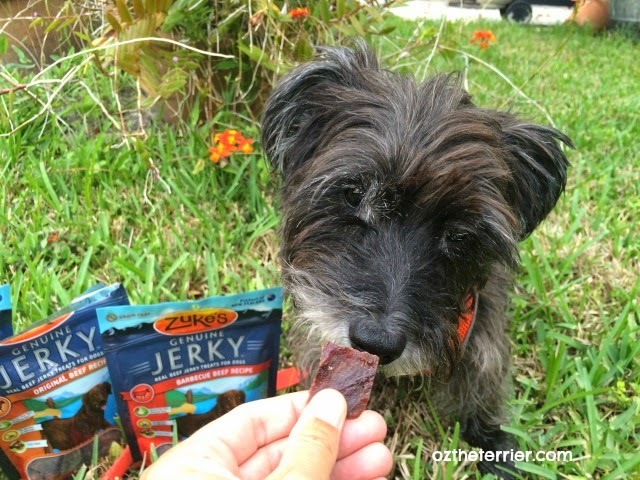 Last Summer, I wrote about fueling up for my Summer Home Adventures with Zuke's Genuine Jerky treats. It doesn't ring a bell? Well, how about this for a reminder: Zuke's Genuine Jerky helped me keep my energy up for some major gator wrestling! I don't know about you, but I enjoy beef jerky. I do know though, that a dog really shouldn't eat beef jerky made for people because it contains nitrates and nitrites. That's why I think it is great that Zuke's makes their Genuine Jerky with only natural preservatives that are safe for dogs. Zuke's Genuine Jerky is really beef jerky at its best! 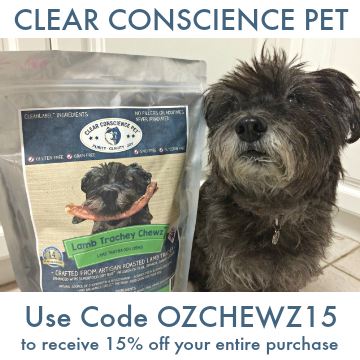 It is made from 100% grass-fed New Zealand beef that is high in both protein and omega-3s. 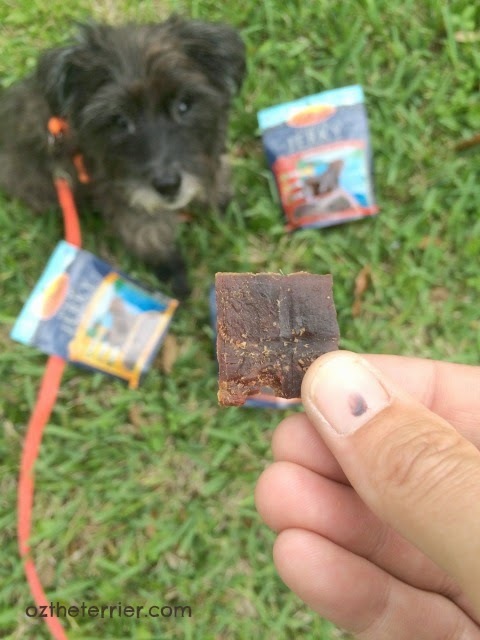 Since the Genuine Jerky dog treats are made from just beef and some seasonings (and natural preservatives) they are also grain-free which is great if you need to be on a limited ingredient diet. I wonder how many of you have already tried Zuke's Genuine Jerky. 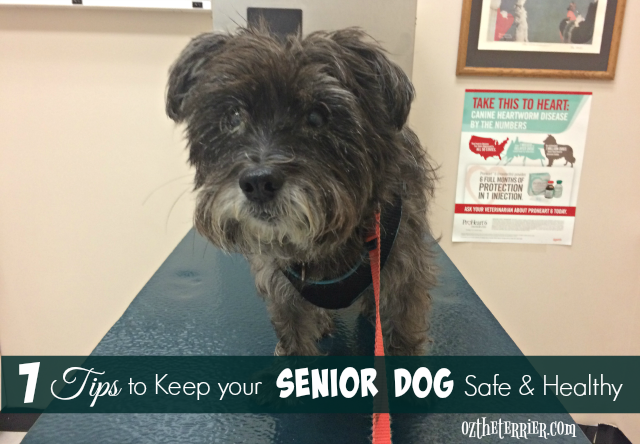 Did you send your pet parent out for some after I wrote about the treats last Summer? 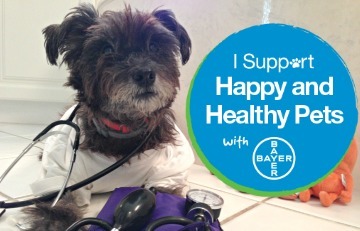 If not, you are going to want to get your paws on some so you can try them! Seriously...because if you like Zuke's Genuine Jerky then you are going to LOVE the new Zuke's treats that will be coming out soon. What new treats, you ask? Well, I can't actually tell you what they are just yet. I can tell you that Ma heard all about them at Global Pet Expo and even tasted a tiny piece. 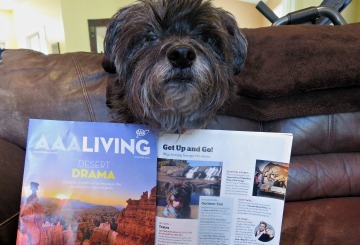 Yep, you heard correctly...Ma taste-tested a dog treat! Any clue what the hint is in the photo? 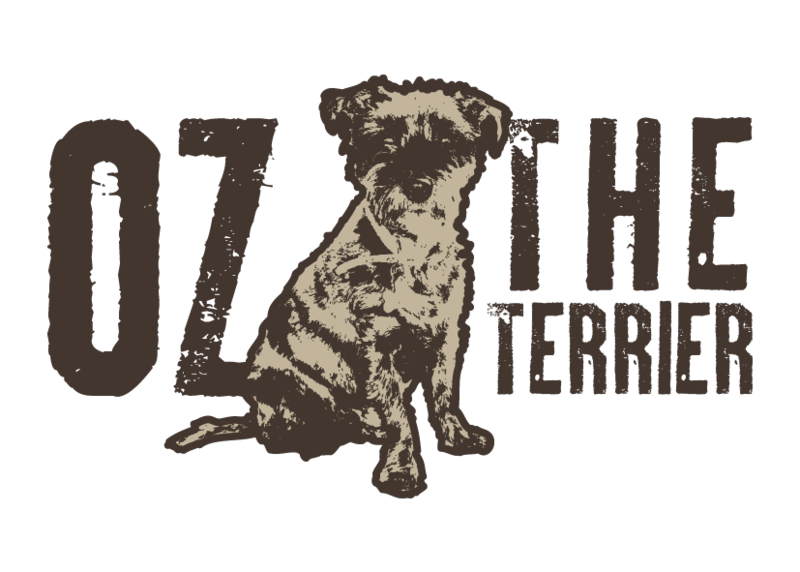 To get your taste buds geared up for the new treats, coming soon, Zuke's is offering one (1) Oz the Terrier reader (U.S. Resident only) a chance to win all three flavors of Genuine Jerky. Enter the Rafflecopter; giveaway is open until 11:59 PM on Wednesday, April 1, 2015. Post Disclaimer: I received one free bag of each flavor of Genuine Jerky in exchange for helping to spread the word about Zuke's products. I received no other compensation for this post. All opinions expressed herein are my own. OH we love that also!! Did not know that about human beef jerky Oz. Happy gactor wrestling to you now you have your Zukes. Have a terrific Tuesday. OMD OMD OZzzzzzzzzzzzzzzzzzz you ressled a GATOR??? And came out on TOP???? Good on you buddy. My guys would probably like the sweetness of the Teriyaki best! 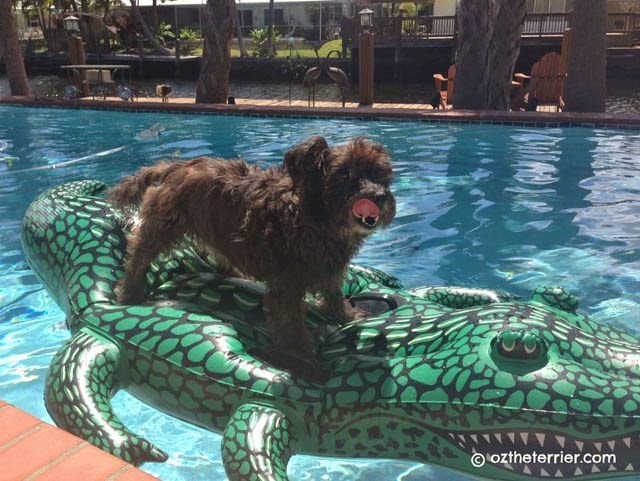 We love that gator photo of you Oz! ps I FORGOT TO ANSWER MY OWN QUESTION!! HUGS MADI AND THE OLD GRAY MARE!! With Zukes you can never go wrong! We love all the flavors! My dogs love the teriyaki flavor. It smells so good I get hungry when I give it to them. Zukes always makes wonderful stuff! Good to know it helps if I ever need to wrestle a gator too! I'm sure Ace would love all the flavors but if he (I) had a choice, we'd pick barbecue! We haven't tried these ones yet but we do love Zuke's! I am excited to hear about the special new flavor as well! 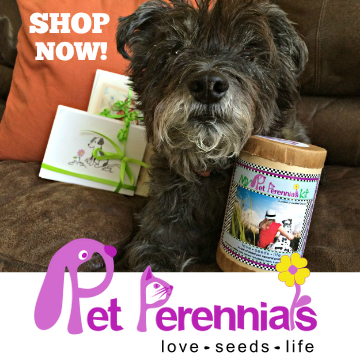 Tell your Mom not to worry - Our Mom has tasted many of our all natural treats as well to see what she is feeding us! P.S. LOVE the picture of you riding that ferocious gator!! I bet I'd like da BBQ best bein a Texas girl. Since all the flavors are beef they sound great to us. Thanks for having this giveaway. 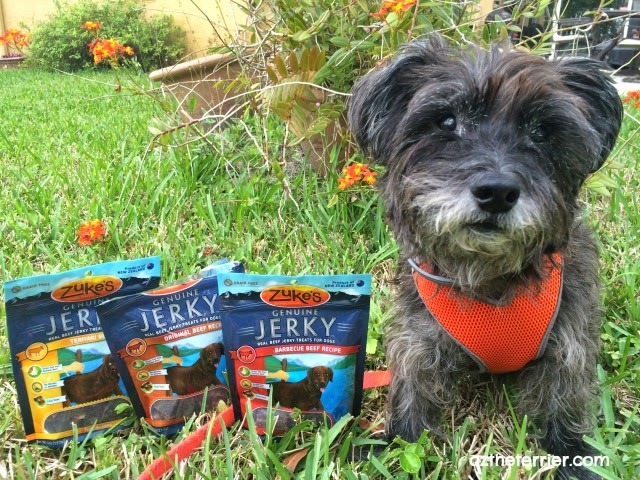 Shiner hasn't tried any of this jerky before, but she's quite jealous! I am not sure what the hint in the photo is... maybe grass? Or something green to eat? These sound like yummy treats. Thanks for the giveaway! I think my gang would love all of them! BBQ would be #1 as we like to BBQ up here too. I can't figure out the clue. My huskies just love Zukes!!!! Good luck to all my U.S pals for the giveaway! I think I would love the Teriyaki Beef! I'm just so curious about the flavor! Lorna loves her original beef! My dogs love the beef! My favorite flavor would be Teriyaki. My 4 rescued dogs tell me all Zukes flavors are their favorites. I'd prefer the BBQ flavor, as well. I think my pup would like teriyaki the best! My dog Josie would like Teriyaki. I use the original zuke's jerky for my dogs a lot, but haven't tried this genuine line yet. I think they'd like the original flavor best. I believe my furgirl, Lady Girl, would prefer the original flavor. She nodded in agreement. 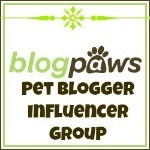 I think the hint in the picture is pull back your paw before the pup gets a nip at your thumb. Coco would probably love all the three, but definitely the barbeque beef! i think bbq beef would be a big hit! My dogs love all the Zuke's flavors... the stinkier the better. I will have to say the Barbeque beef, although my dogs would like all of them equally, I think. The original is the one I'd pick. Thanks! 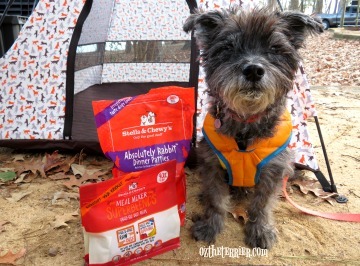 As good as they all sound, I think that the BBQ flavor would really hit the spot for my pup - mmm! THey're all good but Teriyaki sound great! They all sound delish Oz! I know I would adore the Zuke's Original Beef Genuine Jerky.